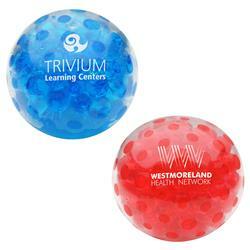 Custom gel stress balls. Clear thermal plastic rubber ball filled with colorful gel-filled beads. Beads inside give a massaging feel when squeezed. Ball returns to original shape when released. 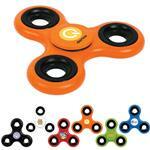 Great for stress relief, physical therapy, exercise or just having fun! Shelf life: 6 months. Production Times Available: 5 working days. 3 day rush production available - call for pricing. Typical Imprint Area(s): 1 inch diameter. Available Imprint Options: Price includes a one-color, one-position imprint. 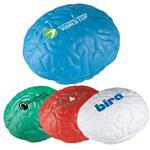 Great for stress relief, physical therapy, exercise or just having fun!